Celebrities in The Sims 4 Get Famous Expansion Pack definitely have a…unique behavior in the game. Sure, their Celebrity Shine might be a bit too much but it’s nothing that would affect your gameplay. However, the Celebrity Walkstyle that’s introduced is for sure to annoy a lot of players considering that Sims who use it are about 50% slower than usual, which means getting to a desired location may take twice as much. This feature is only forced upon Sims who are Celebrity Level 4 and 5 so thankfully not every celebrity is going to get to enjoy this special treatment. Luckily The Sims Team added additional options including the ability to disable both of these features if you wish to do so. 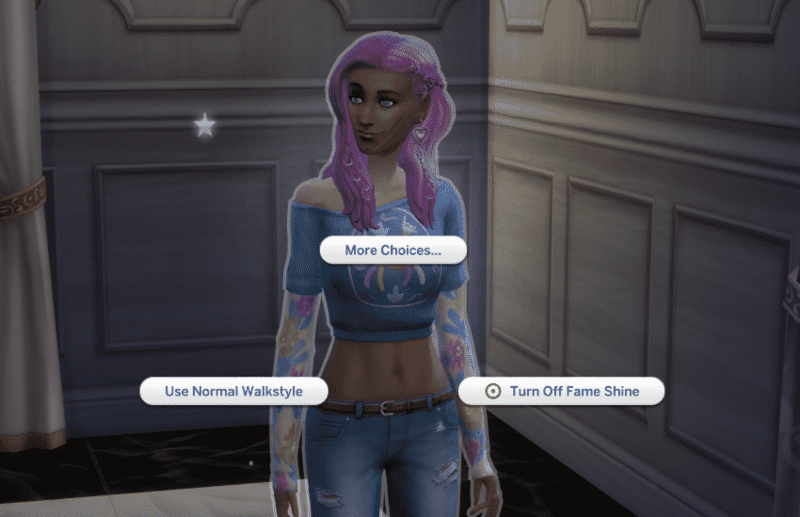 If you wish to disable the Celebrity Walk Style simply select on a Sim of your choice and select “Use Normal Walkstyle”. The same thing can be accomplished for disabling the Fame Shine by selecting “Turn Off Fame Shine”. At the moment there isn’t an option in the game that allows you to turn off these features globally. However, you have full control of enabling/disabling these features on Sims who are not even a part of your household. Is there a celebrity townie who’s slow celebrity walkstyle is simply annoying you? You can just select that Sim and disable the walkstyle if you wish to do so. The problem is that when you try to disable the “Celebrity Walkstyle” the sim turns it back on AUTONOMOUSLY and starts reacting in disgust to absolutely everything! If only it would stay off… but it doesn’t! It’s infuriating! I have stopped playing with my 5 stars celeb sims because of that. I hope they fix this. I was just about to comment that. It’s extremely annoying!! This is the EXACT problem I’m having. I know where to switch the walk off, but after one action, my sim is back to waking ridiculously slow and it’s so annoying. EA NEEDS TO FIX THIS PLEASE. I don’t see this as an option when I click on my Sim. My sim is a 3 star celeb and still has the walk. I click on her and it has no option to disable walk. What do I do now? I have the exact same problem. It’s so annoying! I found a fix! Press shift and click on the sim. Then level his/her fame up to a 4-star celeb. Then level it down again. And boom – you got yourself a normal walkstyle again. Yes, this worked. It was driving me CRAZY! I can’t see the the walk style options.. Turn up to level 5 celeb and it gives you the option phew!